Info "Break all the jars and collect stuff." Kid Icarus is a microgame in localized versions of WarioWare: D.I.Y. Showcase. 18-Volt made and hosts this minigame. It is based on the NES game Kid Icarus. It replaces the microgame Freshly-Picked Tingle from the Japanese version, which features different gameplay. 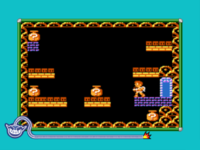 The game begins with two or three pots placed inside a room, and Pit standing near a door. The player must poke every pot to collect items and win. If the player doesn't collect all of them, they lose. This page was last edited on October 8, 2018, at 22:43.